Hurricane Irene is due to arrive early Sunday in New York, and for the first time in history mandatory evacuations are in place for coastal areas in New York City. While Irene has weakened slightly in the last 12 hours, this just reiterates the seriousness of the threat the storm still bears. 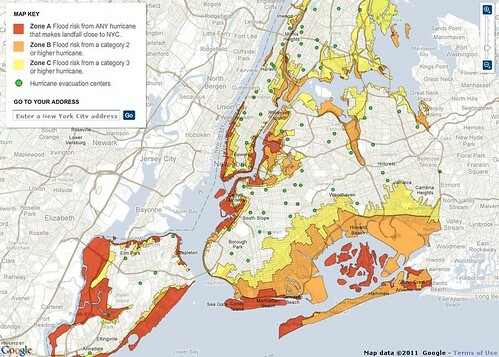 Below is a current evacuation map for NYC, to view the complete interactive map please visit the New York Times. Irene has been downgraded slightly, it is now a category two storm. While strengthening is possible, it is likely to remain a category two over the next 24 hours before eventually weakening to a category one before slamming New York early Sunday. What meteorologists continue to stress, however, is that this does not omit the very real threat for a damaging storm. While inland wind damage may be minimized when compared to a cat 4 hurricane, the expansive size of Irene continues to concern forecasters. With the densely populated areas the hurricane targets, the already saturated ground from record setting rains this month, high tide, and a storm that would cover several states - we have ourself what President Obama is already calling an historic storm. 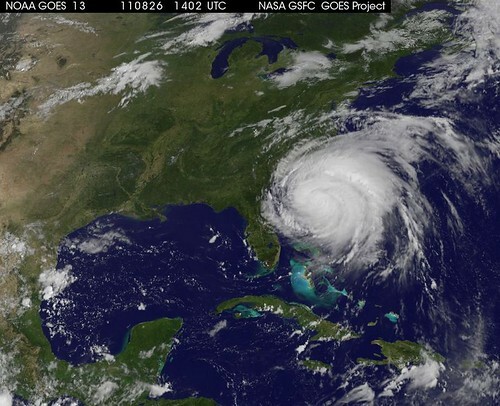 Below is an image from the GOES satellite showing just how enormous Irene really is. More updates to come. If you live in the path of Irene please take necessary precautions. If you have stories or media to share - please do!